Maybe it's the theater geek in me. Or maybe it's because I'm Greek. My people can be very dramatic. In my life, I am opposed to the drama. One of the reasons I can't get into watching most reality shows is because of the high level of all or nothing high jinks. Wether it's real or manufactured, it has the opposite effect on me than I think the producers intended...I turn away. I want life to be as smooth as possible. There are enough real life, unexpected, what the *#@% moments happening, that looking for additional ones holds no appeal for me. But, since I come form a long line of family drama queens and I do enjoy watching a good scenery chewing from time to time on stage, there had to be away for me to participate in the shenanigans. In every room I put together, I try to infuse a little bit of whimsey, personal story telling and a touch of drama. A piece (or two) that draws attention. Something you can't help but notice. Not too much of it. Bring in a lot of drama and it all cancels each other out. You don't know where to look. 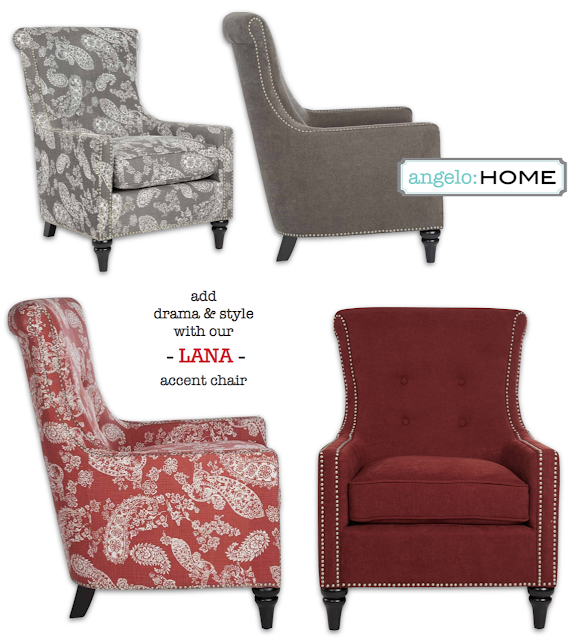 The LANA chair is one of those pieces for me. I wanted something big, yet not too overwhelming. A piece that could handle a room and set a mood. It plays well with others, but make no mistake. It's the star of the show (room). Finding ways to create drama in your rooms is as easy as taking something you love. A style. A color. A pattern and blowing it up. Turning it into a focal point. Instead of a little touch of paisley...cover a whole chair in it. Love the way a certain color makes your room look? Make it the main focus of that space! Drama does not like a shrinking violet. It demands that you make a bold choice. Go forth and make it! love the Lana in that cranberry color--sorry, I didn't look it up for the real color hue name.